The Automation of food processing magazine is focused on the segment of food and beverage production. 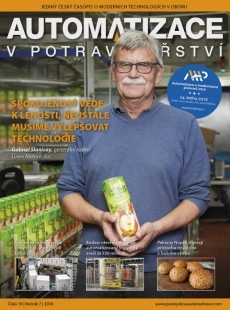 Top managers and technical staff of the food and beverage producers in the Czech Republic and Slovakia will be the core audience of the magazine. It is the only magazine in the region specialized on this particular industry segment. Salima brings together food producers and food technology with MBK Bakery (milling and confectionery), INTECO (the essential fair for hoteliers and the hospitality trade). These three fairs run concurrently to spotlight the very best of Central European food and food technology sectors to buyers worldwide. The international trade fair of electrotechnics, electronics, automation, communication, lighting and security technologies. Traditional conference for technical staff of the Czech, Slovak, German and Austrian breweries organized by publisher of the magazine Automation of food processing. The conference about automation and marking in the production held every year in Mikulov in the Czech Republic. Technological and science news are being named on the traditional meeting Czech professional staff of breweries.